Back pain is one of most common medical problems for people in the UK. It can occur at any point throughout life, but is most common years 35 to 55. The back is foundation of the body and can have a wide range of causes for pain. To truly manage back pain, it is a good idea to get back to basics, understand the underlying cause, and then develop a plan of care. To start understanding the core causes of back pain, it’s important to understand the basic structure of the back. 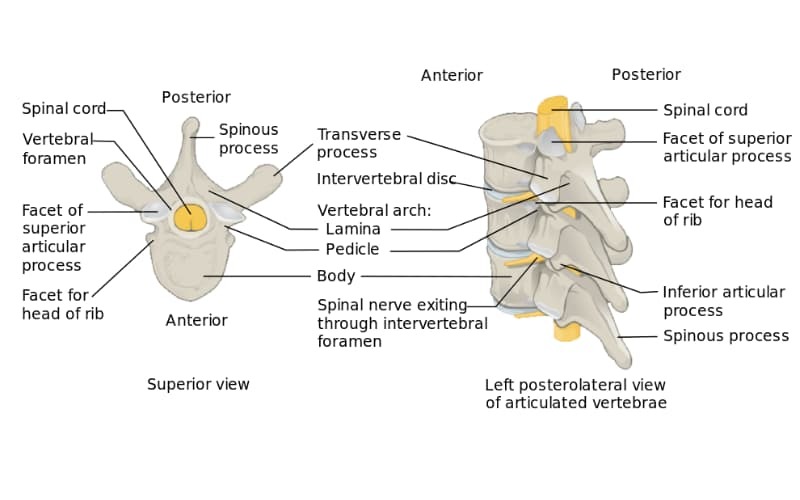 Learning about the structure, the names, and the function of the elements that make up the back helps paint a better picture for back pain diagnosis. Overall, the back is a skeletal and muscular structure that supports the upper body and protects the spinal cord — the pathway connecting the nervous system to the brain. There are 24 vertebrae — small bones — with shock absorbing discs in-between each vertebrae. The vertebrae are held together by ligaments — a type of flexible muscle. Tendons connect the larger muscles of the back to the vertebrae and nerves run from the spinal cord out into the body. It’s a complex, fascinating centre of your entire body. The lower back — also referred to as the lumbar region — is a common location for back pain. The 5 lower vertebrae in the lower back bear all of the weight of the upper body. It’s under constant pressure and can be vulnerable to injury — especially when lifting, twisting, or bending. If you are carrying extra weight, it can make the lower back even more vulnerable to injury. It is the lower back’s vulnerability that makes back pain in this region so common. As many as 7 out of 10 people will experience lower back pain at some point in their lives. It can be easy to injury the area and even the smallest of strains can be particularly painful in this region. The good news is that most minor lower back injuries will heal themselves within a few weeks. The best way to heal quickly and effectively is to keep moving in gentle movements that promote blood flow, but don’t add additional strain. Stretching can also be effective in healing lower back pain. In the case of persistent back pain that lasts longer than 6 weeks, it’s important to seek professional or medical attention. A chiropractor can be a great help in dealing with chronic lower back pain. A general physician or back pain specialist can offer medication, physical therapy, or surgical options for more severe cases. Additionally, an injury in the lower back can sometimes manifest itself in other regions of the body. The sciatica nerve — which runs down the leg — can become pinched in lower back injuries causing pain. The hips and knees can also have pain when the lower back is injured. In most cases with rest and gentle movement, back pain will clear up on its own. If you are just experiencing muscle aches, there is likely no reason to seek immediate medical attention — unless the pain is severe or last several weeks. You are younger than 20 or older than 55. You have or have had cancer in the past. You are or have been in the past a drug abuser or alcoholic. Seeing your general practitioner and explaining all the symptoms will help identify the cause of back pain. From there, you can begin a chiropractic treatment plan. Most back pain is a result of “non-specific” injuries or daily use injuries. These are minor and usually resolves themselves within a few weeks or can be combated with a few lifestyle changes. Common causes of back pain can cause pretty intense pain or discomfort. In certain instances, serious back pain can occur from a trauma or ageing-related injury. Most documented cause of serious back pain is a result of a herniated disc — often referred to as a slipped disc. A herniated disc is when the disc — the spine’s padding — between the vertebrae ruptures. Sometimes people don’t even feel this — but often it can cause serious back pain. The herniated disc puts more pressure on the muscles and bones to support the upper body — which causes strain and pain. A herniated disc can also irritate the sciatic nerve, cause pain and/or numbness in the buttocks, thigh, legs, hips, and feet. The slipped disc can be a result of a traumatic injury, but is also associated with general ageing. As the body ages, the discs tend to dry out and become more vulnerable to rupture. The first step to diagnosing the cause of back pain is to schedule an appointment with your general practitioner. Bring a list of all your symptoms with you to help identify the root cause. From there, the GP will general perform a palpation (hand exam) to see if there is anything unusual and then have an X-Ray taken of the back. In some cases, a CT scan or MRI might be needed to get more detailed information. Once the GP has enough information, they should be able to identify the root cause of the back pain and recommend a treatment plan. They may have you go to a physical therapist or start you on a medication to curb the pain. A general practitioner will help you with diagnosis and be the best for treating traumatic back injuries, but you may want to explore other options for back pain. A chiropractor is trained to address many common back pain issues. Chiropractors also rely on Xrays and MRIs to identify the cause of back pain, but their approach to treatment is different. A doctor of chiropractic medicine directly manipulates the muscles and joints to provide relief from pain. Many people find chiropractic adjustments to be highly effective in relieving back pain. Previous PostJaw Joint Pain, Causes and Treatment.